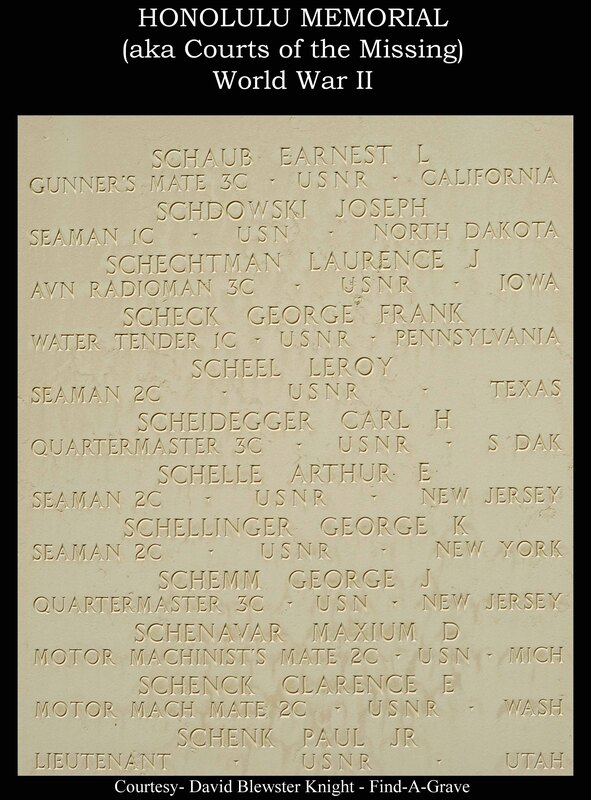 Quartermaster 3/C George Joseph Schemm was declared killed in action in the Pacific Theater on April 1, 1946. He is the son of Mr. and Mrs. William Joseph Schemm, of 45 Division Avenue, Belleville, N.J. Schemm entered the U.S. Navy from New Jersey. His serial number is 02244538. He was awarded the Purple Heart. His service to our country is memorialized at Honolulu Memorial (Courts of the Missing) World War II in Honolulu, Hawaii. The U.S. WWII Military Personnel Missing In Action or Lost At Sea, 1941-1946, lists the date of his loss a March 31, 1945.